Package #4 with an infant swing replacing one of the sling swings. Note the option of a half wall at the end of the ladder beam to allow access from the deck. Please specify when ordering. Jungle package with a two-position swing beam with a sling and infant swing, bottom clubhouse, firepole, slide and ladder. A Jungle Adventurer with a base fort option. Ladder beam (plus extra full wall), flat swing, toddler swing, steps, ladder and wood roof upgrade. This model has a bottom clubhouse, ladder beam with duo glider and infant swing. Also featured is a wave slide, ladder, rock wall and wood roof upgrade. A telescope and steering wheel add a bit of fun at the top of the clubhouse. This is like a standard package #2 with no firepole. Due to space restrictions the swing beam is on the front posts and the cargo net is on the side. A package #6 with the tyre swing removed and a firepole added. A duo glider and toddler swing hang from the ladder beam and a pair of handles have been added to help younger children on the ladder. 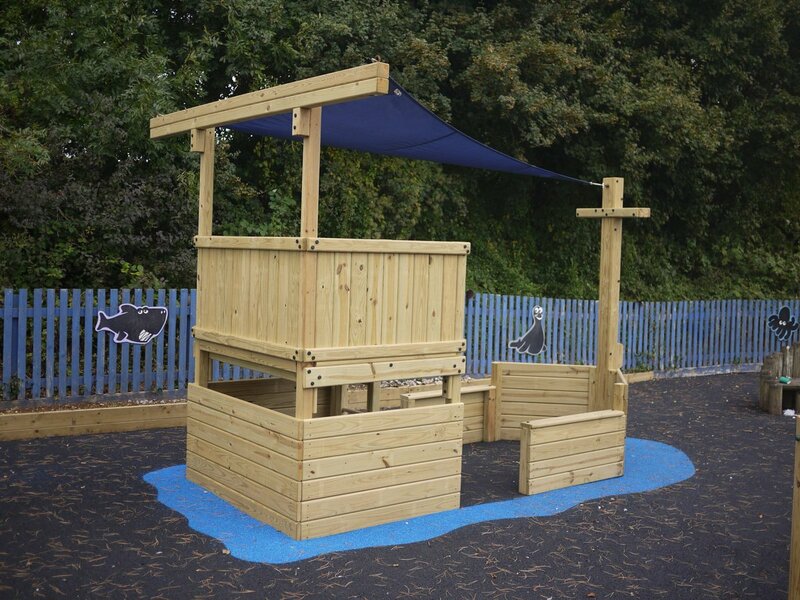 Our most popular residential play model, the Jungle Adventurer has the same 1.2m square playdeck as the Canyon but its at 1.5m in height. This means all the accessories are scaled up to provide more challenging sliding and climbing. And with its extra standing room inside, children won’t grow out of the Jungle Adventurer like some smaller, flimsier climbing frames. The construction is extremely solid like all our back garden play equipment and so will take as many children (and adults!) who want to play on it. Base package comprises two walls and heavy duty vinyl tent top. If you want more details of how well our equipment is built, have a look at our specifications page. Heavy duty vinyl tent top. We have put together a selection of pre-planned packages (below) to help making choosing easier. But the versatility of our designs means we can put together a specific combination for you. So if that’s what you want to do, start with the base package. Then construct your own system from the choice of accessories. You’ll see our equipment is very versatile. And we make everything we sell in our own factory so we don’t just try to sell you what’s come over in a box from China. Call us now on 0845 643 2373 for more information on this range or any of our other top quality back garden climbing frames. Or if you prefer, fill in our contact form. Home Front Jungle Gyms are outstanding in all ways, I couldn't be happier with our experience with the team and the finished result- I would highly recommend them.